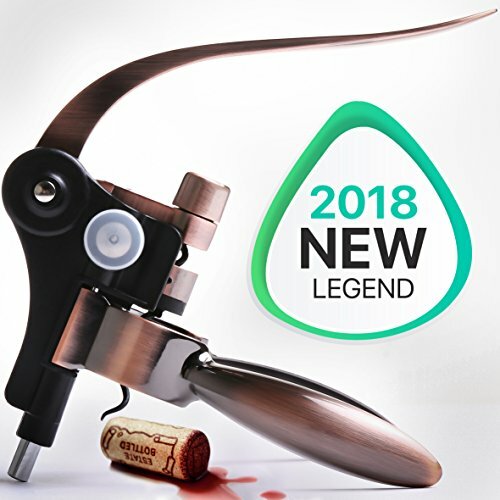 RedNoel - corkscrew opener best of 2018! We offer you the newest wine accessories! Wine opener gift set has not only excellent design but also has a premium quality! 1. Large wine opener copper which opens both natural & synthetic corks, any size of wine or champagne. 2. Extra corkscrew spiral in case of replacement if needed. 3. Sharp and safe foil cutter. No need to use knives and harming your fingers! Let the cutter does the work instead of you! 4. Due to elegant cork opener stand it is very convenient to store the wine tool in your kitchen or bar. 5. Premium wine bottle stopper which can keep your wine fresh for 14 days. 6. Wine bottle opener kit: wine tools are safety packed in our stylish box ,every object is in its place. No worries about scratching! 7. Wine accessory manual box includes simple and clear instructions for you to make opening wine process easy. Holiday lever tool- excellent on any occasion: anniversary, wedding, party, birthday or perfect home wine opener for home using. Our large wine bottle opener is a real wine tool for real men. Best wine opener! Especially perfect wine accessories for women. Manufacturer open wine offers 100% guarantee! Sure you will love our wine corkscrew. This bottle opener will last for ages. While you're thinking how much efforts you need to open your favorite bottle of wine, others are already enjoying the aroma of wine in their glass. Make your life easier with our unique wine bottle opener. RABITT WINE OPENER - This corkscrew opens any size wine bottle with a single pull. No more struggles with broken and stubborn corks anymore! Follow our manual instructions and enjoy the wine bottle opener! WINE ACCESSORIES 5-PIECE SET includes: 1* golden wine opener, 1* removing foil cutter, 1* extra corkscrew worm/spiral, 1* premium wine bottle stopper and 1* modern cork opener stand. The wine opener kit comes in an elegant original brand box. THIS WINE TOOL KIT will make your life easier. Due to its stylish design the cork opener looks awesome in any wine bar and kitchen. Not only an essential thing for sommelier and wine lovers but also for every holiday and party. CORKSCREW is made of high-quality professional materials due to its deluxe design made of durable copper and zinc alloy; it provides a unique combination of nice beauty and good practicality. WINE SET - PERFECT GIFT IDEA! BEST WINE OPENER SET ON THE MARKET! Make a right choice. Buy NOW!